This type of mollusk likes calm, shallow water with a sandy bottom. One of my favorite shells to see up close is the Fighting Conch, or the Florida Fighting Conch (Strombus alatus) as it’s known. It is in the family Strombidae. The Fighting Conch can be found on all Florida shorelines, but they prefer sandy, shallow water where wave action is minimal. That’s exactly the type of place I discovered this one. Before I came across this living mollusk, I had collected an empty fighting conch shell while visiting Sanibel Island. On the Gulf coast, this shell is more common than where I am on the East coast. So what is a conch shell? (Pronounced “konk”) By definition it is a large, spiral-shaped seashell. It is big, but thicker and heavier than other gastropods, like the whelks. 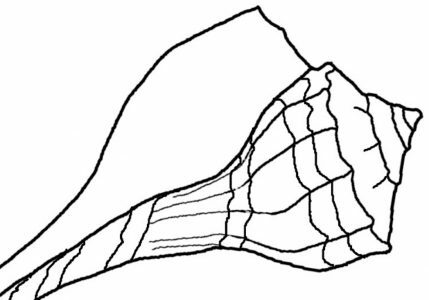 The conch is the living creature inside which is sometimes harvested to eat. Conch is on the menu in many tropical based restaurants, and the meat can be from any large gastropod shell. I’ve also come across a broken and worn Fighting Conch shell with a hermit crab inside. This happened while exploring another similar type of island. Recently, I was lucky enough to come across this living Fighting Conch while walking the beach of an island in the Florida Intracoastal Waterway. I didn’t think to measure it, but I’d estimate it’s length to be around 4 inches, and they don’t get much bigger, according to my seashell reference book. The Beautiful Fighting Conch – this one is alive. The chunky, wide-bodied shell, with a more compact spire, is a giveaway as to the name of this one. It is known to “fight” or jump at other shells that could be a danger to it, hence the “fighting” name. It also has some beautiful coloring. From the dark purple with orange edges underneath at the aperture, to the light purple on top (it’s spire), even though this one has some green algae and a few barnacles, it was a lovely sight to behold. I couldn’t help but wonder how beautiful it would have been all cleaned up. I took it to the boat to show my son – how often do you find something so awesome? I got my iPhone to take these pictures, and then left it in the shallow water which is it’s home. My video of this living conch shell. Somehow it ended up in Slow-motion (I am not tech savvy), which shows the sea water slowly coming in around the shell. If you are ever tempted to try “conch” when out to eat at a Florida restaurant, this is the type of thing you are eating. The living shells are collected and the animal is pulled out and cooked. I’ve found other living mollusks while out boating. This big horse conch was pretty cool, and even a little pear whelk with the mollusk inside. The Pink conch (or Queen conch) is a threatened species due to over-harvesting. For this same reason I no longer buy seashells from gift shops or shell shops. When I am walking the beach, or visiting these islands out on the river, I always only collect empty seashells. Next Post Why So Many Black Seashells? You stated the animal is “pulled out” and killed to bring us that meal …. no different than a cow / pig / chicken that is killed to bring us a meal … circle of life … happens . Really cool post and pictures. We just recently had conch fritters for the first time. Thank you! I’ve never had them. They’re pretty tasty. Definitely worth a try. love this! why are they called fighting conch? They can quickly jump, or flip themselves over, and will sometimes scare off another conch this way (so I’ve read). They don’t really fight, and the one I found did none of that. He was very docile. That hermit crab is looking for a new shell no doubt! Thanks Pete. Imagine the wonderful photos you could have taken!